The PiranhaMax 197C from world class producer Humminbird is one more fish finder that caught our attention. Thanks to its low price, it falls into the budget range, but it still comes with some solid features. The ideal use for a unit like this would be on a small freshwater boat. Humminbird offers quality products, and this one is not an exception, even though it has limitations. This device has a dual beam sonar and moderate size display. The screen size and dual beam sonar help you see what's going on underneath your boat and bellow the water level. It could also be considered portable since it weighs only 2 pounds. This is a unit made for people who want to get basic sonar functions without many added features. It won't confuse you with too endless options and can be put to good use in a matter of minutes. This sonar fish finder has a 3.5-inch color TFT screen. This display comes with a resolution of 240H x 320V. In all honesty, it's a small screen that doesn't put out a high-quality image. With that said, it's as good as what the competition offers for the price. This fish finder's small screen and compact dimensions make it ideal for use on a smaller boat or ﻿kayak. Everyone knows space scarce sometimes on a kayak because of other crucial equipment. If you are experiencing a shortage of real estate, this might be the right finder for you. This unit has a LED backlight screen made especially for conditions that might compromise visibility. It functions well under direct sunlight as a result, but also in fog, and at nighttime. The advantages of fishing at night include less boat traffic and disturbances in the water. It also means you might be the only one fishing in the area. If you want to adjust the screen, you can change the contrast settings. Contrast provides a higher definition with accents to the light and dark parts of the sonar. To see a particular part of the sonar return close up, you can use the zoom function with this model. Some structures and fish might not be visible otherwise. The zoom option is available from the menu. The Dual Beam sonar in this product uses 200/455 kHz frequencies with a 28° conical area of coverage. This type of sonar is for showing high bottom definition by using a narrow 16-degree beam. For indicating fish targets, it uses a wider, 28-degree beam when the Fish ID+ feature is in use. As you move along in your boat, this device displays the changes in depth and creates a bottom contour profile. With the Sonar View, you can see a different intensity for returns in a color range. Blue shows a weak return and yellow indicates a medium strength return, while red indicates a strong return. If you want to set which sonar readings will be on display, you can use the Beam Select option. Unfortunately, there are no specialized sonar readings that come with this unit. But for the price, you can get your foot in the door, and get a taste of fish finders. Even though this unit doesn't have much in the way of features, it has some essential ones. With Selective Fish ID+, the fish finder can interpret sonar returns for you. When a particular set of requirements are met, the PiranhaMax displays a fish icon. That means you won't have to squint and wonder if what you see is a target. This function assigns fish icons to incoming information from the transducer. It is useful for beginners who aren't quite sure what they're looking at on their fishfinder display. It can also save time for more experienced fisherman. One added feature is the fish alarm. It doesn't need much explanation, but what is does is make a distinct sound when the sonar picks up a fish. It sounds off when sonar readings match user-made settings. There is also a depth alarm function which works in the same way. 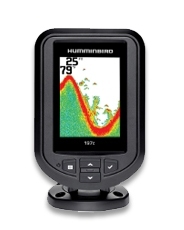 Included with this Humminbird is a bracket designed to swivel and tilt. That way you can move it around and adjust it to your liking. It's easy to set it up and view the display even if you change positions on your boat. If you want the optional in-dash mount, you can buy a separate kit from Humminbird. The transducer on this unit comes with a built-in sensor that lets you measure and track water temperatures. This is important to know because different species of fish have different preferences when it comes to temperature. For example lake trout live in waters between 48 and 52 F. In contrast, a species like largemouth bass thrive in a temperature range from 68 to 78 F. You can see this is quite the difference, so a tool to measure temperature can be a useful feature for any angler of fisherman.